Found in the fresh water lakes and rivers of Belize. Locally called the snake bird because of howit swims with only its long snake-like neck above the water. I see them in the Chan Chich lake often. The Anhinga (Anhinga anhinga), sometimes called Snakebird, Darter, American Darter, or Water Turkey, is a water bird of the warmer parts of the Americas. 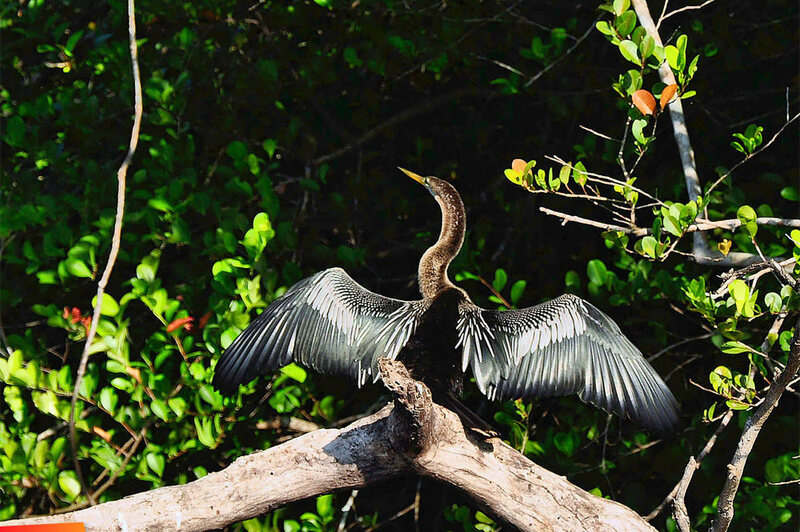 The word "anhinga" comes from the Brazilian Tupi language and means devil bird or snake bird. It is a cormorant-like bird with an average body length of 85 cm (33 in), a wingspan of 117 cm (46 in), and a mass of 1.35 kg (48 oz). It is a dark-plumaged piscivore with a very long neck, and often swims with only the neck above water. When swimming in this style the name Snakebird is apparent, since only the colored neck appears above water the bird looks like a snake ready to strike. When necessary, the Anhinga will dry out its wings and feathers, with the resemblance of the semicircular full-spread shape of its group of tail feathers while drying them out, to that of true meleagrine males lending the name "water turkey" to it. It will perch for long periods with its wings spread to allow the drying process, as do cormorants. If it attempts to fly while its wings are wet, it has great difficulty getting off the water and takes off by flapping vigorously while 'running' on the water. Anhinga will often search for food in small groups. The A. anhinga species is a large bird and measures approximately 89 cm (35 in) in length with a 1.14 m (3.7 ft) wingspan. The A. a. anhinga is larger than A. a. leucogaster and has "broader buffy tail lips". They weigh 1.22 kg (2.7 lb). The bill is long (about twice the length of the head), sharply pointed and yellow as are the webbed feet. Most of the male Anhinga's body is a glossy black green with the wings, base of wings, and tail being a glossy black blue. The tip of the tail has white feathers. The back of the head and the neck have elongated feathers that have been described as gray or light purple white. The upper back of the body and wings is spotted or streaked with white. The hatchling starts out bald but gains tan down within a few days of hatching. Within two weeks the tan down has been replaced by white down. Three weeks after hatching, the first juvenile feathers appear. Juveniles are mostly brown until first breeding after the second or third winter.